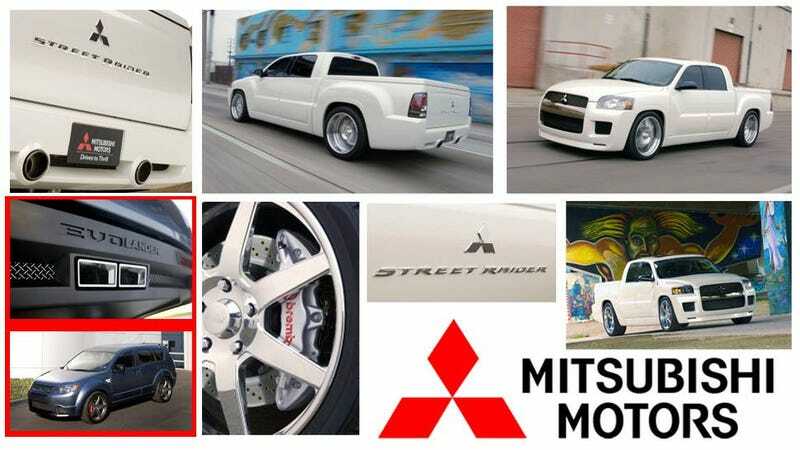 Earlier today I found myself on Mitsubishi's corporate web page browsing a gallery of concept cars. I laughed when I came across the Street Raider pickup truck and EvoLander SUV. Why? Because they're exactly the opposite of what Mitsu has produced lately. Like the Mirage, a car branded as "a new kind of fun”...because the traditional definition didn't apply??? It’s fascinating to look back at a brand’s concept vehicles to see where they thought they were going, both in design and product offering, and contrast that where they are today. Mistu EvoLander is in RED in the image above.